Lloyd Rees produced his first known etching, an interior of Brisbane Cathedral, in 1913 although no impressions have been found. He made two etchings in Sydney in 1922 encouraged by Hardy Wilson and Percy Leason, who were colleagues at the advertising agency Smith and Julius. Both prints were of architectural subjects and reveal the influence of American artist Joseph Pennell, whose drawings and etchings of buildings inspired Rees as a young man. The posthumous edition was printed by Diana Davidson at the Whaling Road Studio, North Sydney. It is thought to have been etched at the same time Rees was sharing a flat above Cremorne Wharf with two Brisbane friends, Walter Taylor, an etcher, and Peter Templeton, in 1919–20. Wal Taylor had made an etching after a Rees drawing of 'South Brisbane Town Hall' and encouraged Rees to make his own etchings. 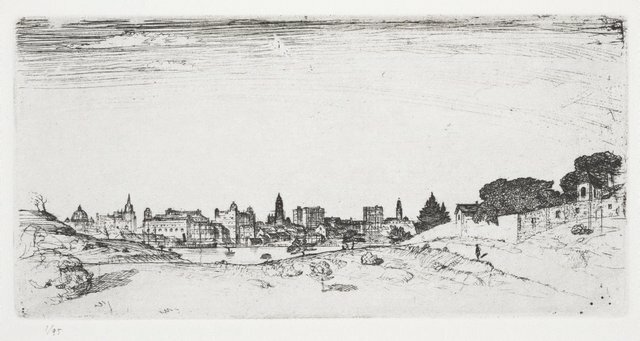 The subject of this print is Sydney from Waverton Park, looking across Berry’s Bay, where Rees lived in 1918 and 1920–22.